International shipping can be very expensive, so I have put together a limited offer for free shipping for my new book when my two newest tutorials are purchased. My second book is Kumihimo Endings – the finishing touch for every braid and I wrote it in response to the frequent laments over the years of how difficult people find the finishing process for kumihimo. Many people confess to having drawers full of unfinished braids because they love to braid, but hate to finish off the ends! My aim was to produce a concise handbook which would not only explain the basic finishing methods for beginners, but would also give inspiration to more experienced braiders. I also wanted to free braiders up from the need to buy specific findings by giving creative alternative options. The format is bright and fun and the size is convenient and portable. I have been delighted by the response to this book and by the wonderful comments made by customers. The book is specifically about how to finish off kumihimo and I had so many techniques and tricks I wanted to share that there was simply no room for instructions on how to make the designs. For this reason I kept most of the braids fairly simple and the majority of images show things which can be made from my YouTube videos or the free tutorials on this website. However, here and there I needed to add something a little more complex to illustrate the effect of a particular technique. For these designs I am writing tutorials because they require more explanation and photos. These two tutorials make a great pair because they both involve post-braiding embellishment, but in different ways, so they are a wonderful way to extend your skills and open up new design possibilities. 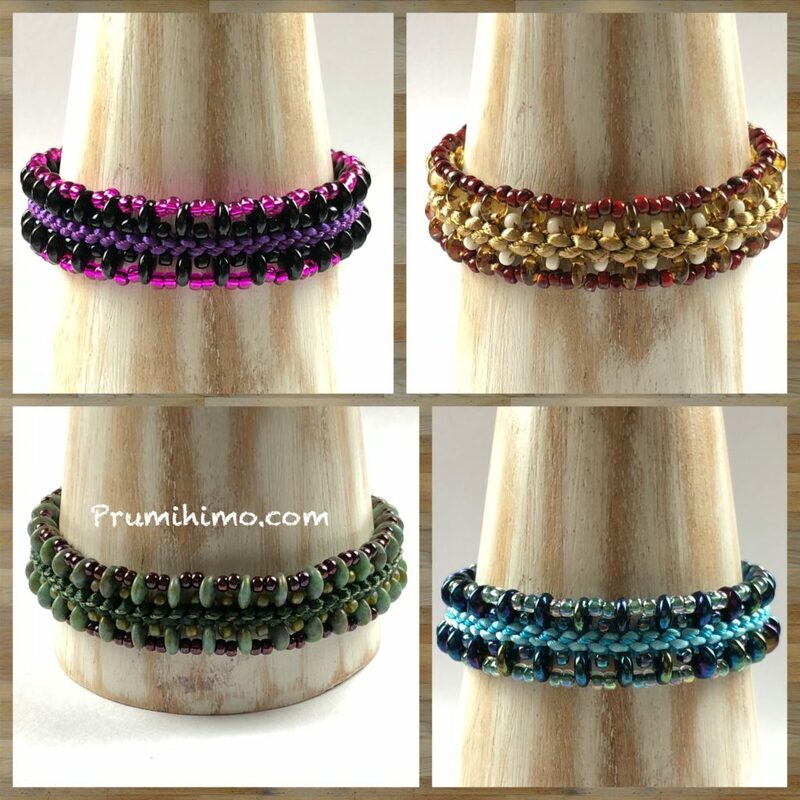 The first tutorial is Candy Cuff, which is a double bracelet made of two Prumihimo braids joined with 2-hole beads and featuring Candy Beads, which are a small round cabochon-shaped bead. You will see this bracelet on the back cover and on page 27 in the chapter on Glued Endings. The braid is made with satin cord, which can vary considerably in width. This has an impact on the spacing of the beads, so three alternative layouts are provided to ensure success. The second tutorial is Desdemona, which is a narrow cuff-style bracelet, embellished on both sides. You will see this bracelet on pages 37 and 70, so you can see it both in the open and closed positions. Again, this bracelet is made with satin cord, so the instructions explain how you can adapt the bracelet for any width of cord. 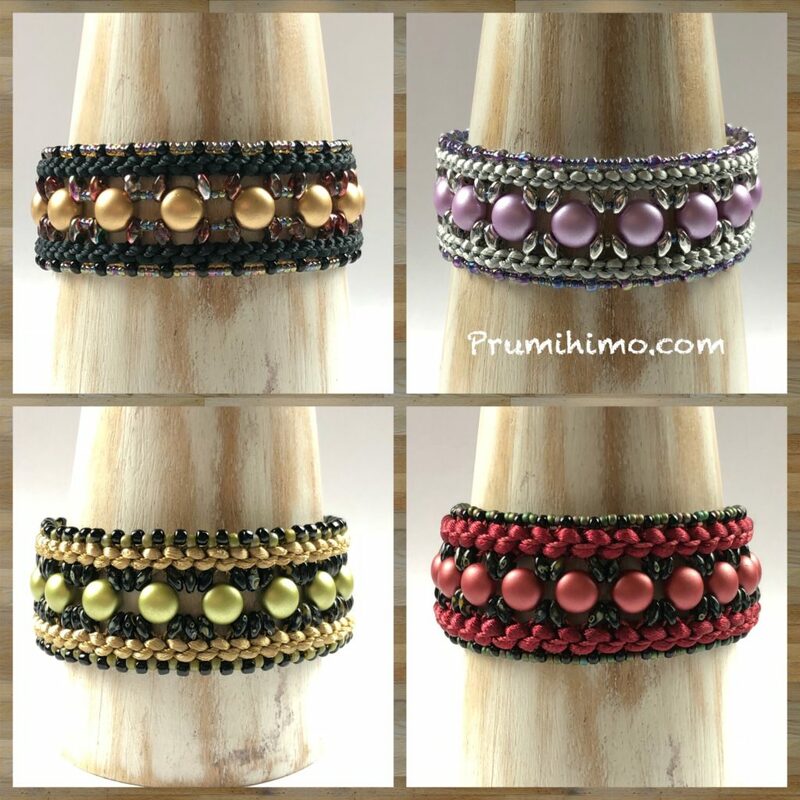 This is the third tutorial in my Prumistitch series of tutorials, where I teach how to embellish a single Prumihimo braid. As I am launching these two tutorials as the same time I thought it would be helpful to offer to send the book with free shipping when both of the tutorials are purchased. This is probably a limited offer for just a couple of weeks, but if it is popular I may extend it. The Prumihimo disk is my own invention and it is required for both tutorials. It is available here.